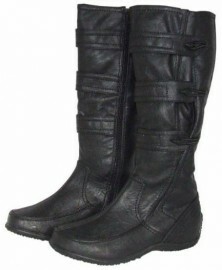 Soft imitation leather knee high ladies boots. Feature stitching & extendable elastic buckle detailing for extra fit on the calf. The ladies boots have a full length zip. Leg height 35cm. Moulded sole & heel with excellent tread.